Designation: Associate Professor, King Faisal Medical School, Saudi Arabia. Research Interest: Specialties: Consultant Vascular & Endovascular Surgeon. Reliability of Sonoelastography in Predicting Pediatric Cervical Lymph Node Malignancy. Published by Springer-Verlag GmbH Germany, part of Springer Nature 2018, in Pediatric Surgery International. July, 2018; Vol. 34(8): 885-890. Surgical Treatment Strategies of Iatrogenic Giant Femoral Artery Pseudoaneurysms. Published by iMedPub, in the Journal of Vascular and Endovascular Therapy. Vol. 2 (1:5). DOI: 10.21767/2573-4482.100037, Feb. 2017. Surgical Repair of Behçet’s Aortic Aneurysms in the Era of Endovascular Surgery. 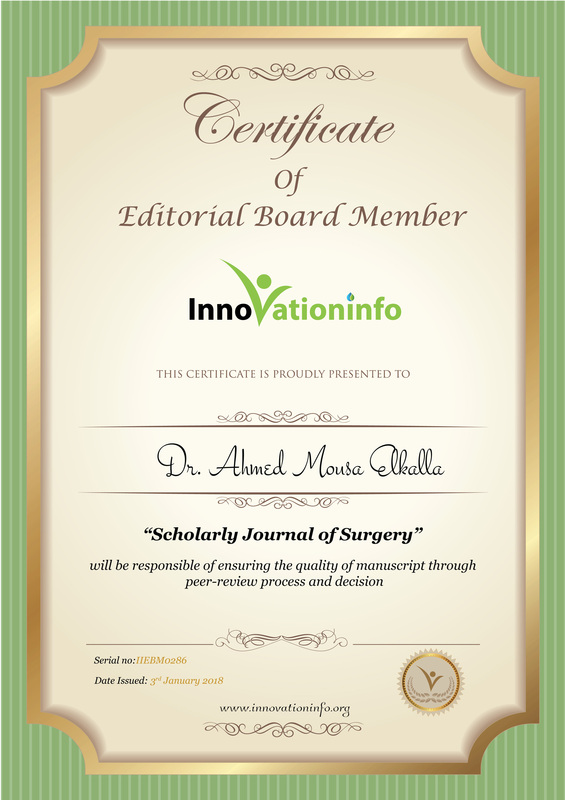 Published by Innovation info, in the Scholarly Journal of Surgery. Feb. 2016, Vol.1 (1):1-7. Early Technical and Clinical Results of Endovascular Treatment of Internal Carotid Artery Stenosis in High Risk Surgical Patients. Published in the Scientific Journal of Al-Azhar Medical Faculty [Girls], the Official Journal of the College of Medicine for Girls, Al-Azhar University, Cairo, Egypt. May 2009, Vol.30 (2):865-874. Retrievable Inferior Vena Cava Filter for Prophylaxis and Prevention of Potentially Fatal Pulmonary Embolism. Published in the Scientific Journal of Al-Azhar Medical Faculty [Girls], the Official Journal of the College of Medicine for Girls, Al-Azhar University, Cairo, Egypt. September 2009, Vol.30 (3):1059-1067. Combined Percutaneous Endovascular Iliac Angioplasty and Infrainguinal Surgical Revascularization for Chronic Lower Extremity Ischemia: Preliminary Results. Published in (Vascular), the Official Journal of the International Society for Vascular Surgery (ISVS) USA, April 2010, Vol.18 (2):71-76. Multicentre study of Combined Thrombo-embolectomy and Intraoperative Thrombolysis in Acute Lower Limb Ischemia. 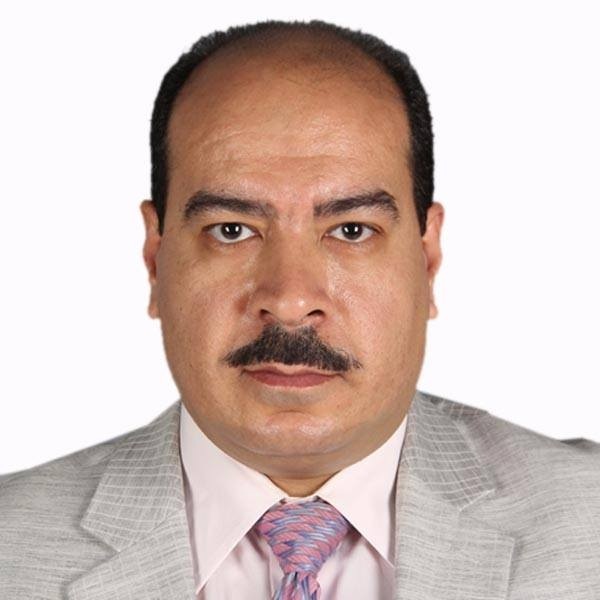 Published in the Scientific Journal of Zagazig Medical Faculty, the Official Journal of the College of Medicine, Zagazig University, Zagazig Province, Egypt. September 2010, Vol.16 (2):214-220. Extra-anatomical Bypass for Chronic Lower Limb Ischemia. Published in the Scientific Journal of Al-Azhar Medical Faculty [Girls], College of Medicine – Al-Azhar University – Cairo – Egypt, January 2008, Vol.29 (1):1149-1157. Aortobifemoral Bypass Using Mini-laparotomy Technique. Published in the Journal of the Arab Society for Medical Research (ASMR), the Official Journal of the National Research Center, Dokki, Giza, Egypt, June 2011, Vol.6 (1):29-34. Role of Infrapopliteal Balloon Angioplasty in the Management of Critical Limb Ischemia. Published in the Journal of the Arab Society for Medical Research (ASMR), the Official Journal of the National Research Center, Dokki, Giza, Egypt], June 2008, Vol.3 (1): 57-62.